Synopsis: After witnessing a murder, a punk rock band is forced into a vicious fight for survival against a group of maniacal skinheads. Review: This is how I know I’m getting old. When I watch America’s Funniest Home Videos, I cringe when people fall down instead of rolling on the ground laughing like I used to. At amusement parks, I think about hurting my back when considering a towering rollercoaster. And overly gory films cause me to yelp and cover my eyes as I squirm in my seat instead of satisfying the demented cinematic bloodlust that drove me directly to the horror section of any video store I ever entered as a youth. So you have to understand why Green Room was such an uncomfortable, yet thrillingly visceral, experience for me. 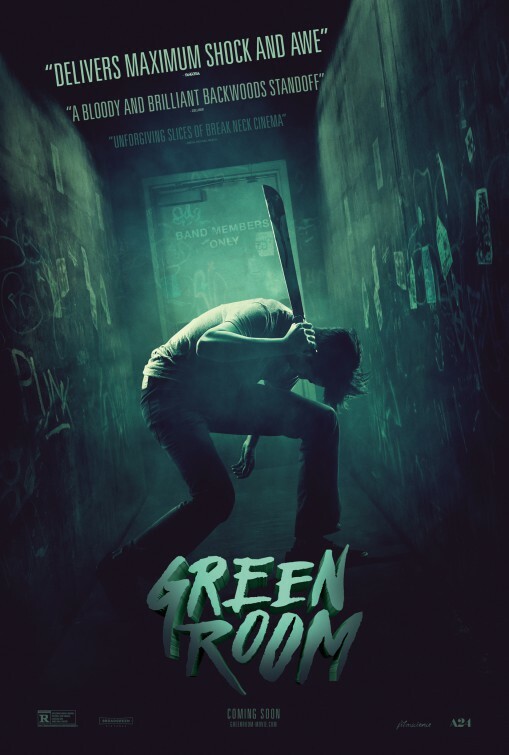 Following a punk rock band of stoned out millennials into a backwoods neo-Nazi bar where they find themselves targeted for extermination, Green Room is one of those films you must steel yourself up for. The violence is shocking and sickening, not just because it comes out of nowhere but because it feels like some taboo boundaries of taste are being broken. Stomachs are slit open, throats are mangled, limbs nearly severed…and that’s just the tip of the bloody iceberg director Jeremy Saulnier has in store for audiences that dare to enter. It’s safe to say that any film that boasts Patrick Stewart (The Wolverine) as its headline star has some level of sophistication and for all the entrails spilled and bones broken it’s a handsomely made picture, well-designed to feel contained yet not claustrophobic. Dimly lit interiors go nicely with the stark solemnity of the northwest forest that surrounds the club and the band as they spend a night trying to survive Stewart and his gang of skinheads. With a breaking voice that sounds like he’s just getting it back, Anton Yelchin (Only Lovers Left Alive) is a gangly hero that spends the first twenty or so minutes in a quiet daze only to be jolted into the present by the very unfortunate circumstance he finds himself in. Alia Shawkat (The To Do List), Joe Cole (Secret in Their Eyes), and Callum Turner (Victor Frankenstein) are his bandmates, all distinctly written by Saulnier even without an excess of defining dialogue. Who lives and who dies isn’t as clearly telegraphed as you may think, with allies popping up in unlikely places only to not be the saviors we think they are. Sporting a new wave mullet, Imogen Poots (That Awkward Moment) glums around the perimeter of the action and is barely a presence until she’s called into action. Saulnier isn’t afraid to dispatch characters with little fanfare or reverence, yet the sadness of their violent deaths weighed heavily on my mind for days after. It’s a fairly haunting film overall, with no real satisfaction gained when the credits roll. What gratification is present is seeing a director making the most out of his remaining time helming indie-ish projects. After the success of Blue Ruin and now this razor sharp crime thriller, it’s clear that while the characters he writes go down hard, Saulnier is only going up. Interview ~ Ryan Guzman, Tyler Hoechlin, & Blake Jenner from Everybody Wants Some! !